‘The History of The Phantom Comic Book in Australia, India and Sweden’ is a three-year research project (2011-2013) being undertaken by Kevin Patrick, a PhD candidate at Monash University (Melbourne, Australia). It will combine archival investigation, along with field research interviews and an international online audience survey, to provide a holistic account of the creation of an American comic-strip/comic-book franchise (The Phantom), and the various political, cultural and economic factors that have influenced its popularity in its most important international markets – Australia, India and Sweden. The project will be informed by several theoretical frameworks, encompassing elements of the political economy of communications, media history, critical legal theory and audience studies, thereby allowing the creation, dissemination and reception of this media property to be examined from multiple perspectives. By doing so, this research project aims to reinstate a pivotal, yet overlooked, character (The Phantom) to the narrative of comic-strip/comic-book publishing history, and reconsider its influence on the development of the costumed superhero genre. 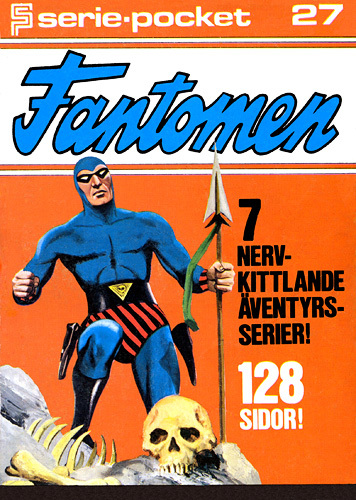 Through incorporating findings from its tri-nation online audience survey, this research project will bring a further international dimension to the study of comic-book audiences, which to date has been dominated by a largely Anglo-American focus (Image courtesy of PhantomWiki). Hi Phil, great to hear from you, and hope you can take the time to complete the online survey. You can contact me via my email address given at the bottom of the page titled ‘About the Survey’. – Kevin Patrick. Hope your research project is progressing well! Thanks for the kind words. I have another Phantom story of the way, a contemporary tale with the working title Citadel of Demons. Just wish Frew would use my original English language script as the basis for lettering, instead of using online computer software to translate the Swedish translation back into English! You’ve no idea how depressing it is to see dialogue you’ve laboured over turned into stilted sentences… Such is life, as a famous Australian once said.